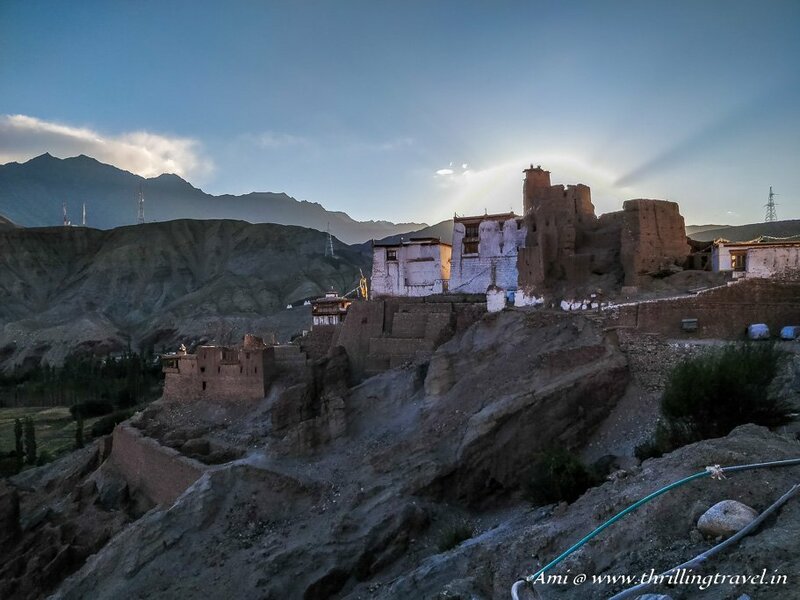 I stared at the pretty landscapes as our van tackled the curves to Alchi Monastery in Ladakh. My gasps at the stunning scenery had got stuck in my throat for each view turned out to be better than the one I left behind. Until I saw the tall crumbling walls of what seemed like a castle – atop a hill. My breath released and my pulse raced as it always does when I see the ruins. 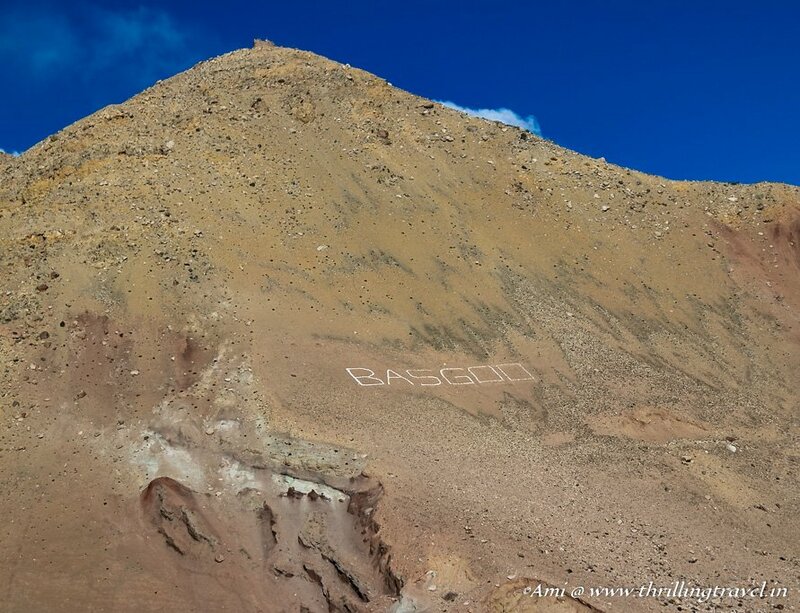 Basgo – a large sign on the mountains announced the name of the town. And thus, was my first glimpse at the Basgo Monastery and Castle. Basgo used to be a bustling town in the yesteryears with a palace and monastery atop a hill. There was little else that my research prior to my trip told me. However, the one thing that caught my attention was that this was declared as one of the 100 endangered heritage places in the world by the UNESCO. The Indiana Jones in me was keen to find out why and the first glimpse definitely did not disappoint me. Scouting it in was like a stamp to this listing. 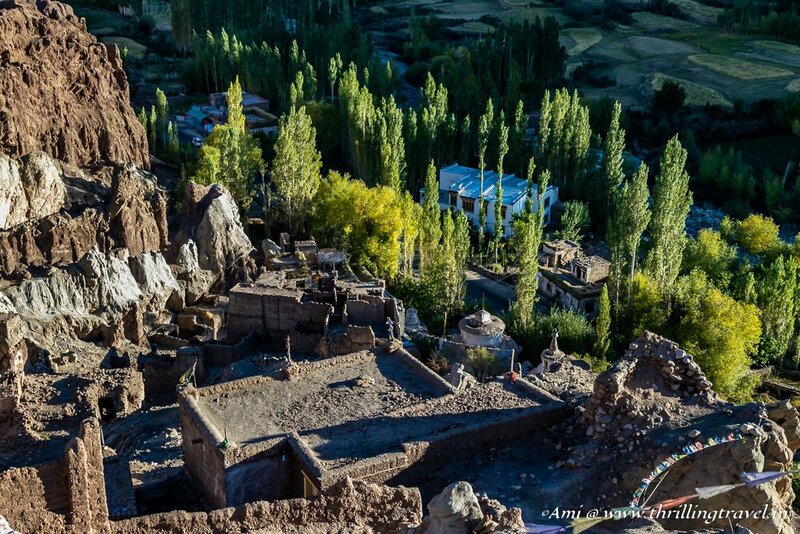 I am sure that by the time you explore it with me, you too, will agree that Basgo is one of the key places to visit in Ladakh. With the kind of ruins that I saw, I expected the history to go back to 10th century or so. Interestingly, these aren’t so old. They date back to the 1680s. The time of the Mughals, except here they are associated with the Namgyal dynasty. Owing to its strategic location, Ladakh was constantly attacked the Muslim rulers of Central Asia. 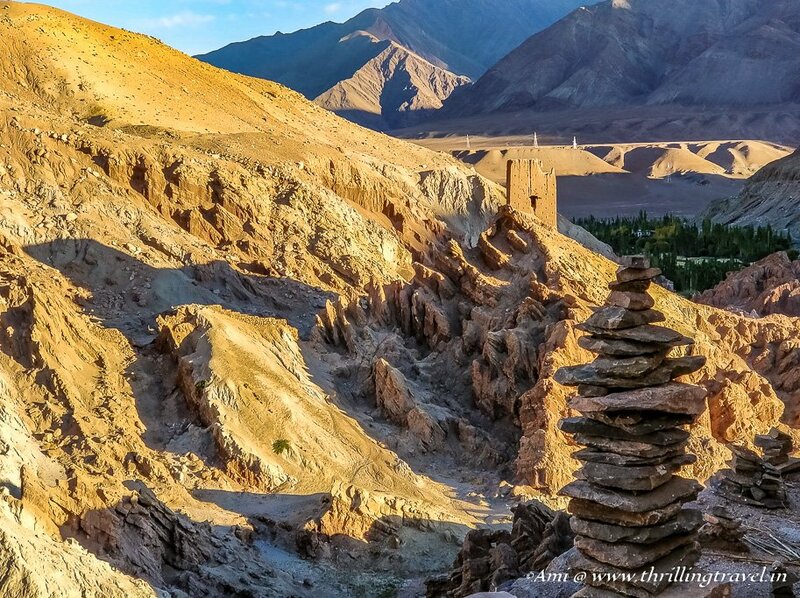 Eventually, there were two major kings who ruled Ladakh. 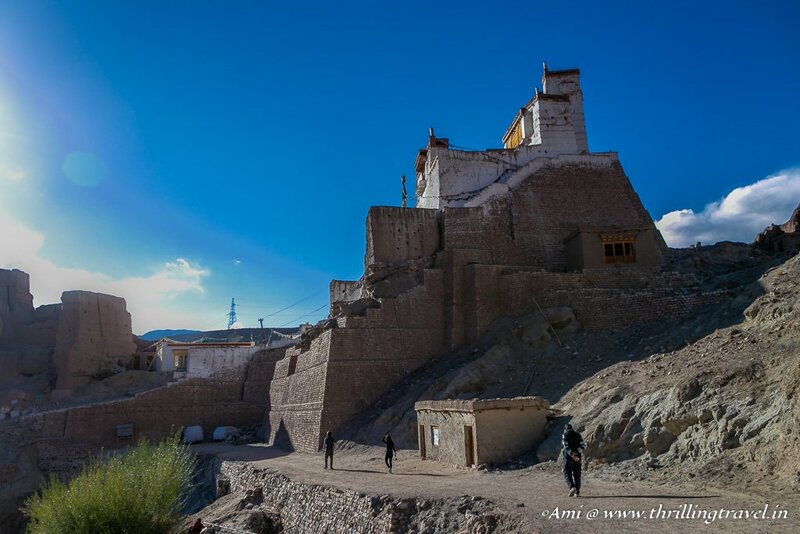 The North Ladakh which included Leh was ruled by King Takbumde and the southern part by King Takpabum. Eventually, the original king from Basgo – Bhagan fought back and got his kingdom back the Leh King. 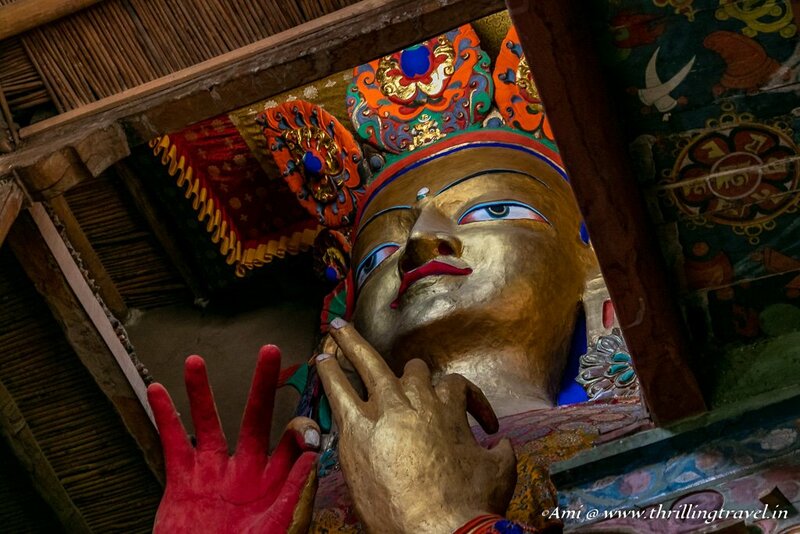 He took on the name Namgyal – which means triumphant. 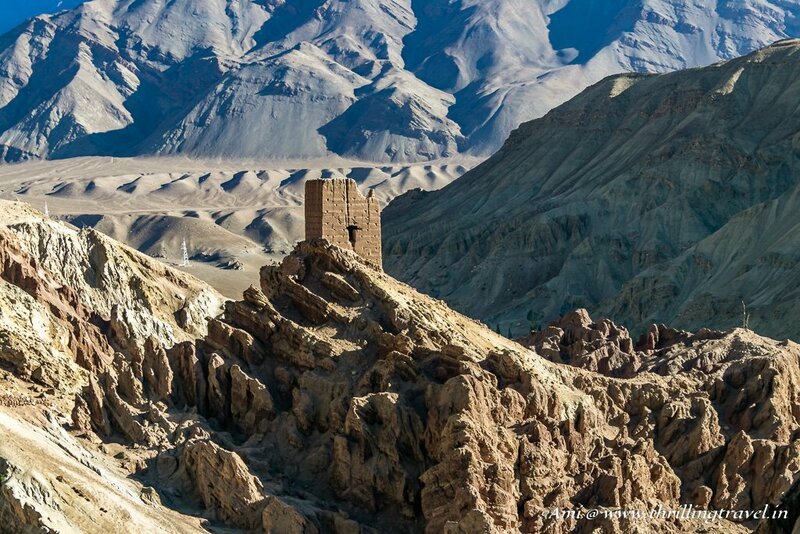 He started fortifying Ladakh and his dynasty kept a hold for many centuries after that. 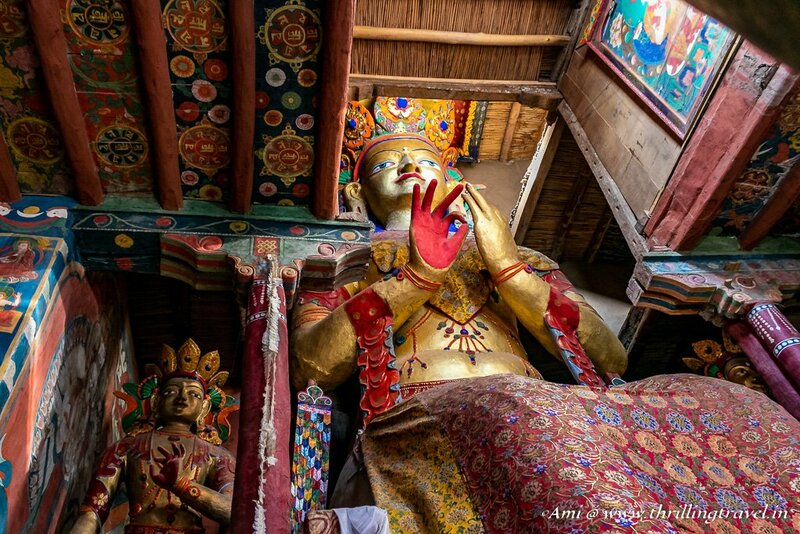 His descendants – Dharmaraj Jamyang Namgyal and Dharmaraj Singay Namgyal are the ones who are credited to have built the Basgo monastery and castle. 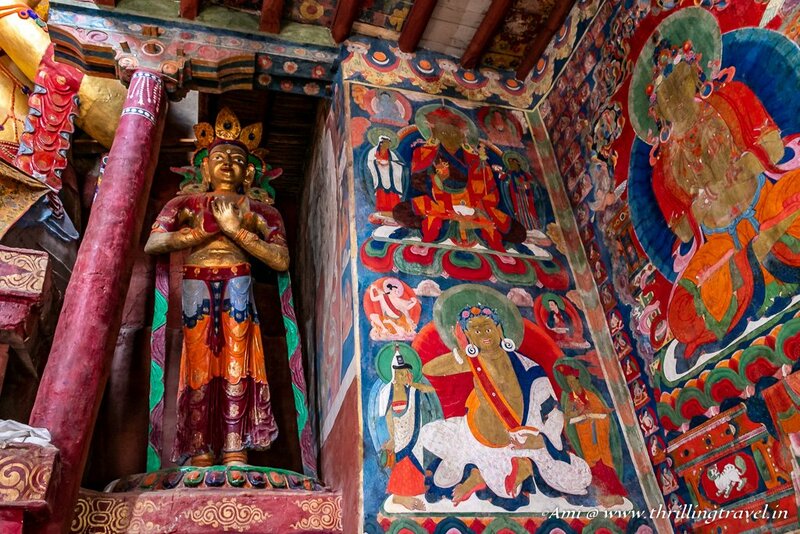 One of the Buddha images built by King Jamyang is in fact, a funerary for the Father King. 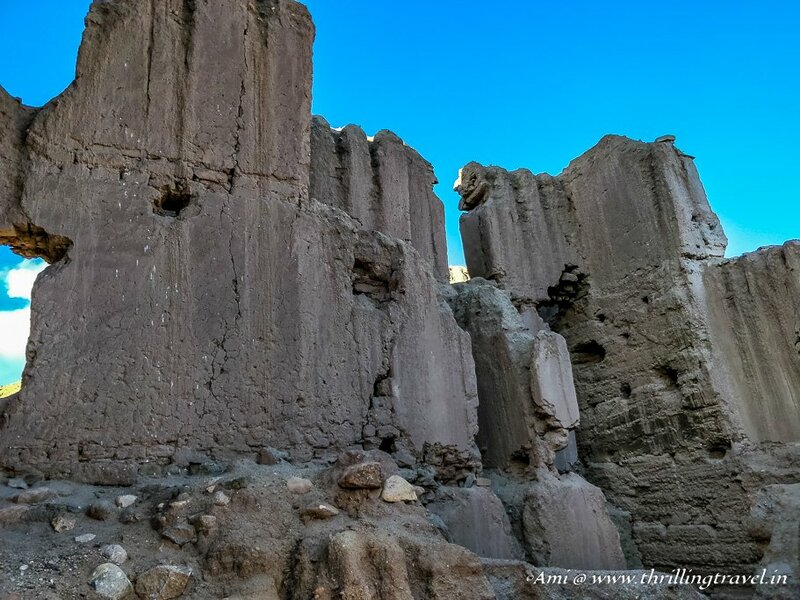 The crumbling walls of Basgo stood tall over the village, setting off light streaks – almost as if they were highlighting the best features of the ruins. It was easy to see how formidable the castle might have looked in its heydays. 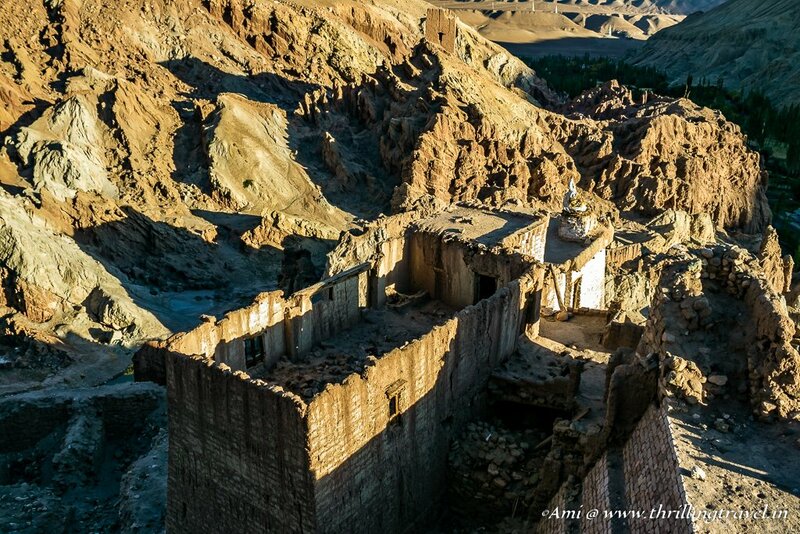 Built at 300 meters over the village on the already tall mountains of Ladakh, I am sure the enemies would have thought twice before attempting to raid it. 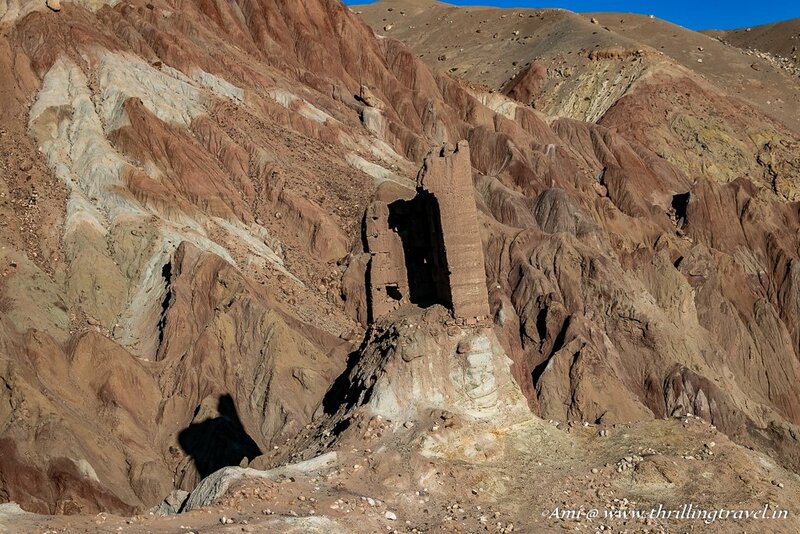 The brown earthen walls of the erstwhile Basgo castle were now in shambles with some parts being indistinguishable from the surrounding mountains. I could see only parts of them and most of them visible owing to them standing solo. The main structure that stood out was just the Basgo Monastery. They were a cluster of white buildings enclosed by the ancient walls. As I understand, the white too, is a recent addition in a bid to restore and preserve what is left of Basgo. A familiar frenzy filled me as I walked to the steps of the monastery. The excitement of finding hidden alleys and treasures got my adrenaline high. I am sure my eyes looked like how Tom’s would (of the Tom and Jerry fame) when he did speed reading. I scanned the lone board at the entrance of Basgo for its history. 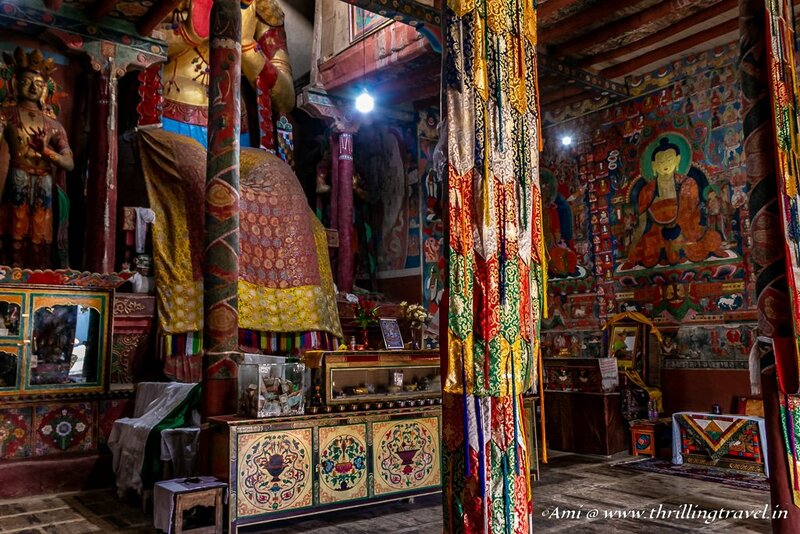 There were just three living shrines remaining of Basgo Monastery – the Chamba Lhakhang, the Serzang Temple and the Chamchung Lakhang. Each one of them had some fascinating feature. From where I stood, I decided to tackle the higher temple first. And off, I went to discover the Chamba Lhakhang. A sign told me that I needed to buy tickets to visit the Basgo Gompa but where was not clear. I followed the flight of vertical stairs to the Chamba temple and even though I had reached the top, I still could not see a window. In fact, none of the temple doors were open. Not wanting to waste any time, I circled around the temple for some amazing views of the ruins around. I found some doorless balconies, interesting walls structures, closed doors – but no person in sight. As I descended back to the entrance, I heard someone call. They had managed to find a monk who issued tickets to this temple and had opened the doors to us. With the same zest as before, I bounded up the stairs to enter a small room. Thank heavens that I saw what I did for if I had missed it, there was no point to the Basgo ruins. 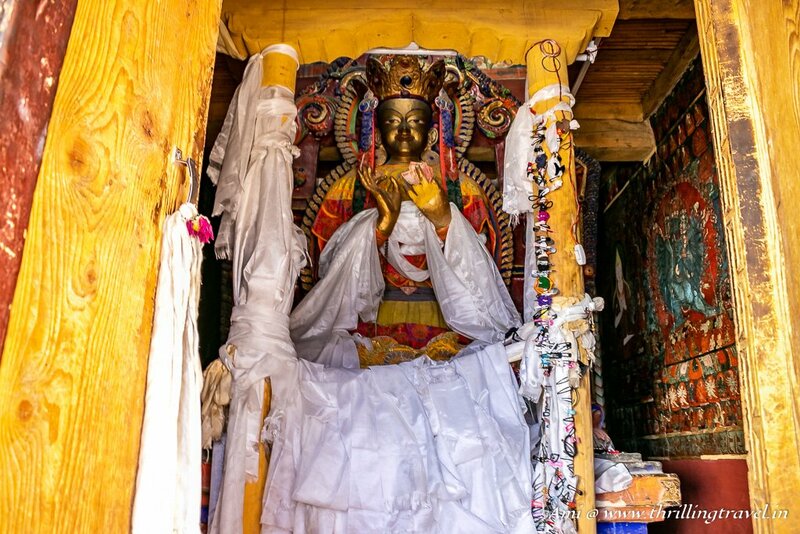 A 2-storied statue of Maitreya Buddha (fifth incarnation of Shakyamuni) stood in the center of this temple. When I entered, I could only see the body and hands of this idol. It was only when I got closer, I saw the serene face of the idol. The Maitreya Buddha at the Chamba Temple is made out of clay. It was made by King Drakspa Bumlde in the 1490s. 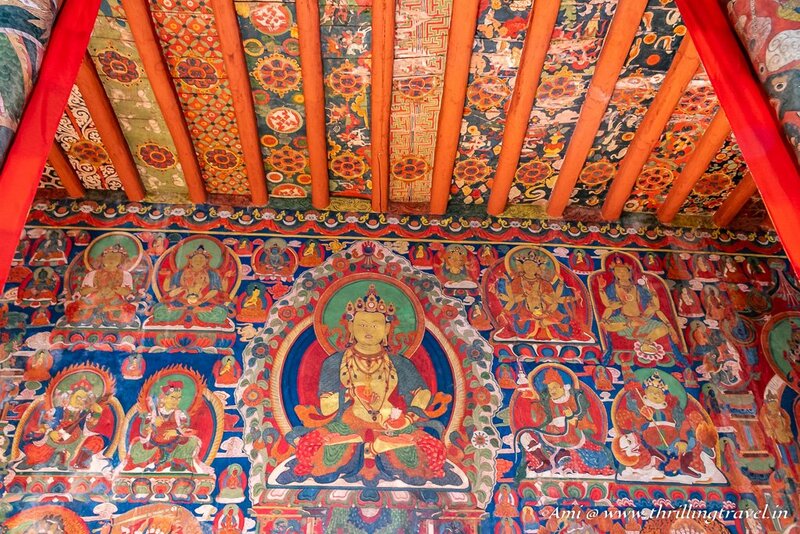 However, it was King Jamyang who added the surrounding color fo the temple by building it and adding the colorful murals to it. From the ceiling to the walls, there was so much to grasp here. Along the walls were some idols of Buddha. And in these, I spotted one on either side of the main Buddha that looked like a standing miniature of the main idol. The same face, the crown and the colors. My guess is that this might have been a prototype before the large one was built. However, with no guide or signs or even people around, I could not be sure. While we were busy at the Chamba temple, a few of our group members chose to explore the Serzang Temple on the right-hand side of the entrance. As I bounded down the stairs towards Serzang, the returning visitors from there urged me to hurry as the monk was waiting for us and was ready to close the temple. That was like adding fire to my raging fuel and though there were interesting sights outside the temple, I blindsided them and rushed in through the gate. At the gate, there was like a crossroad. One temple that seemed to be through a narrow passageway on the left and the other straight down. Thankfully, I saw the waiting monk straight ahead at the Serzang temple. 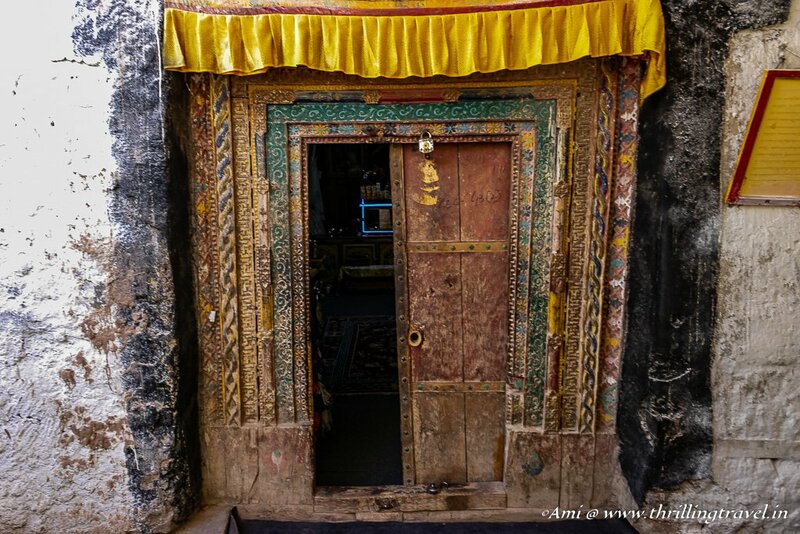 A small cute, old door led me into a dimly lit shrine where I encountered yet another gigantic idol of a Maitreya Buddha. The only difference was that this was slightly smaller and the entire statue was visible from the entrance. 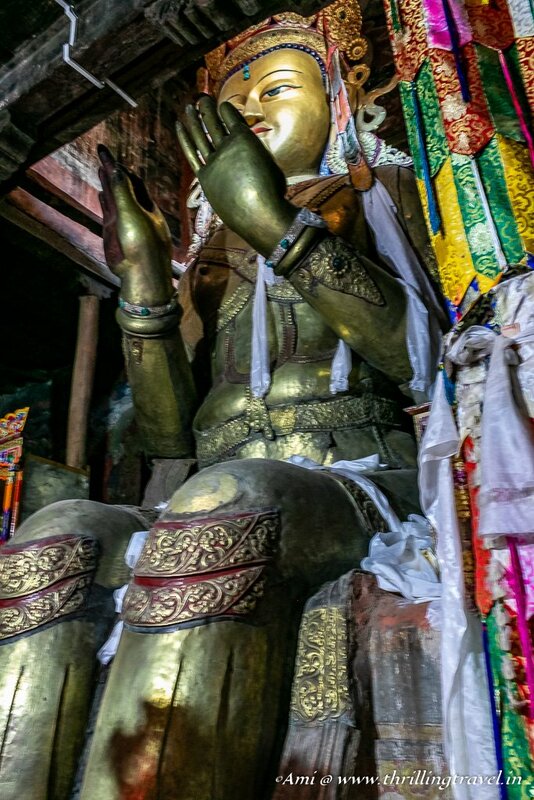 This Maitreya Buddha in the Serzang Temple was made of Copper. This was started by Jamyang Namgyal but completed by his son. While this was one distinct feature of this temple, it wasn’t the only one. The temple was home to sacred books of Buddhism like Kangur and Stangur, written in 5 precious colors like Gold and Silver. The monk around was not aware of where the books were for his superior was at Hemis Monastery, attending the Naropa festival. He did say that the texts were still around. As I waited for the rest of my group to finish examining the small temple, I played truant by climbing the narrow stairs and crude stones to see if I could find a treasure of my own. And I did – by way of these ancient windows that might have been a part of the Basgo castle or the narrow flight of stairs that might have led to some room. It was time for the last temple at Basgo. This one was unique not just for the lovely Maitreya Buddha statue but for the fact that it was originally a Mosque. It was built by a Balti prince Gyal Khatun but was converted to a Buddhist temple later when he converted. It is that which possibly explains the manner in which this was built – almost as if the traditional dome of the mosque was changed to the spire of the temple. 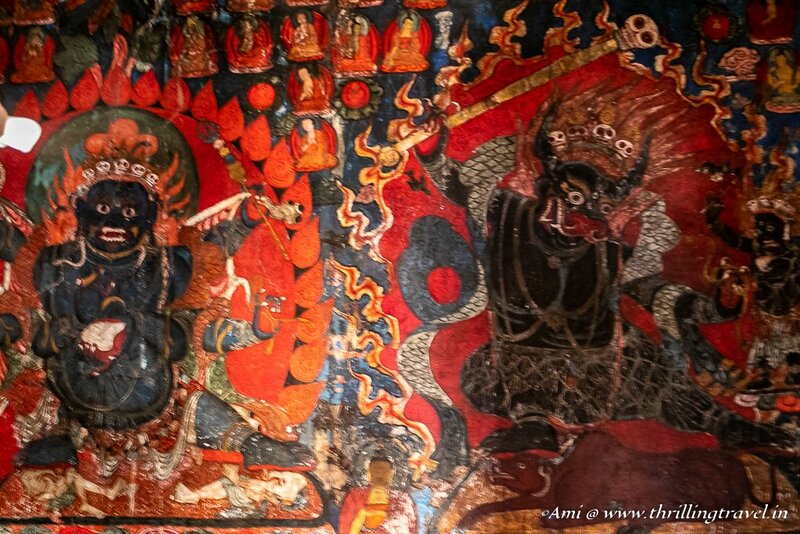 The other interesting thing about the temple for me was that on the walls were images from Tantric Buddhism. The typical destruction of evil. Quite unlike the previous two shrines. The shrine was a small one, enough to just let two or three people within it. However, it was the location that made it important. It was literally perched on the edge of a cliff and as you take a walk along its walls, you get some magnificent views of Basgo Castle and the Basgo Village. 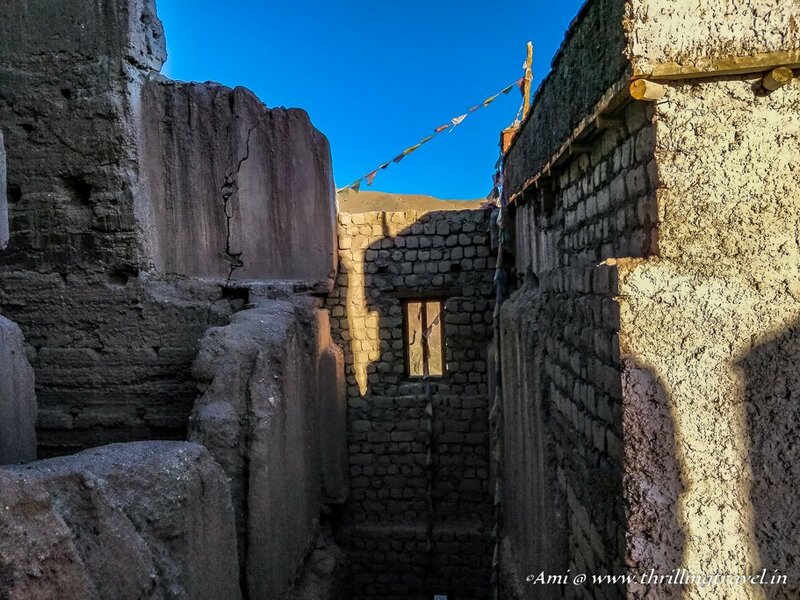 Empty walls, fallen rooms, glimpses of the staircases in between and what might have been the narrow passages between the rooms – there was little left of the Basgo Palace. No one is allowed within the rubble that is left but my heart still yearned to walk there. I just felt as if there was something being missed. It was the same feeling that I got when I glimpsed the Jal Mahal in Jaipur from far. With a stone on my heart, I turned around and walked out of the Basgo Monastery. It is then I noticed the stacked stones that people left behind for Good luck. The same ones that were found around Pangong Lake. That made me realize that people did still visit here and the temples were living. The disrepair makes you think otherwise. As I understood from the lone signboard that I had seen earlier, the Hemis Monastery is in charge of Chamba temple while the Serzang is being maintained by the Basgo village. There have been active steps taken to restore and protect what is left of the monastery but there is more that needs to be done. I hope that someday, there is a path that leads me to the incomplete scouting that I have done at the Basgo Castle. 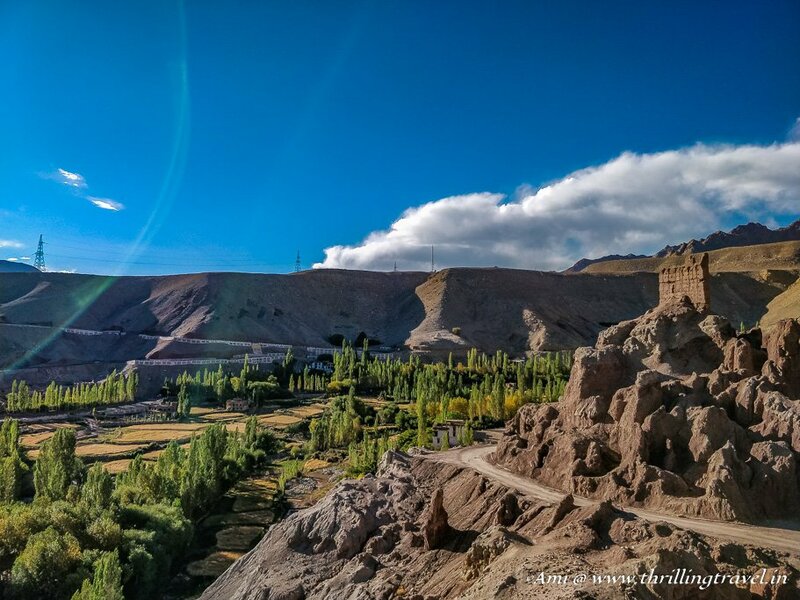 However, till then, I leave you with a hope that you too, found it interesting enough to add it to your list of must-visit places in Leh. To get to Basgo, you will need to hire a cab in Leh. The roads to the place are fairly well done and the ride is quite smooth. The Basgo Monastery timings are from Sunrise to Sunset. It is open on all days. There are separate tickets for each of these temples – each ticket being INR 40 per temple. Photography is permitted in the shrines. However, ensure that you do not use flash. Wear hiking shoes if possible as the steps and the path along the Basgo ruins is quite uneven. Speaking of steps, some of them, especially to Chamba temple is quite high. Take your time climbing them. One can get accommodation in Alchi. However, the same is limited. It is best to opt for Hotels in Leh. The history lessons and photos make for a captivating post Ami. Well done. 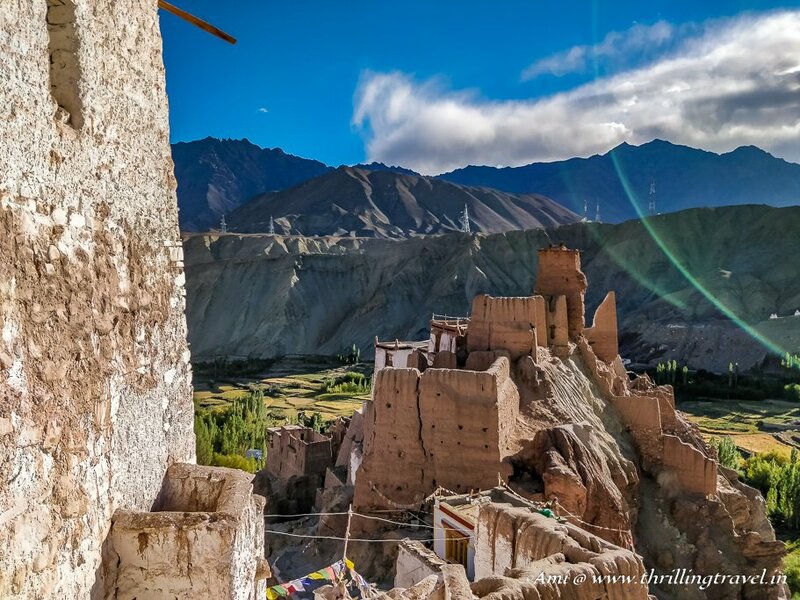 Ladakh look so beautiful! There is so much to see and to do. It looks like a really beautiful drive. You captured awesome pictures on your travel trip. Thanks for sharing a beautiful post with us. Wow! Loved the ruins of Bhagso. It looks like an ant hill. Murals are also intriguing. Indeed. They do look like ant hills, albeit giant ones. Stunning photos! I know of Ladakh, but never made it out there, now I feel like I really missed out. Will need to make it a priority when I’m next in India! It is so different from the rest of India. You should definitely come back for it. I just took another trip to ALchi through this stunning post, Ami! Love your style of writing. It is as if, I am talking to you in person! Thank you Madhurima. That compliment made my day! I cannot believe the Meidtra Buddha is made out of clay. It is so colourful for dating back to 1490. 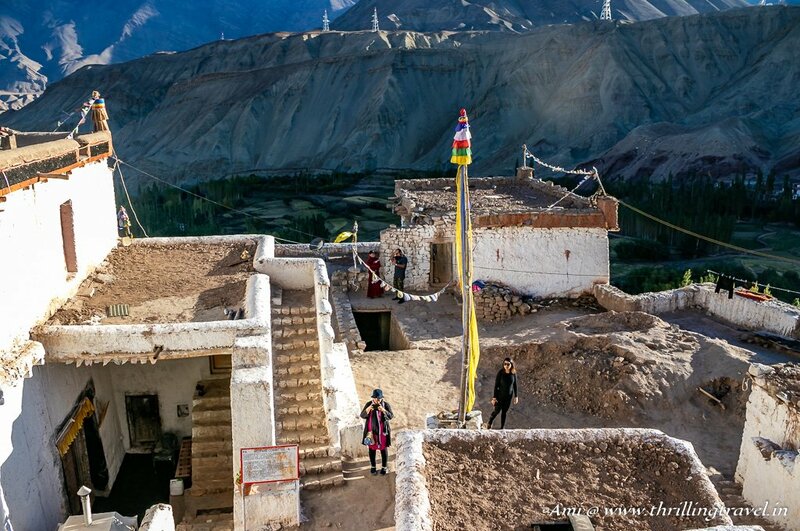 I love this part of India and the mountains and prayer flags. When I first saw the photo I also imagined this site must be much older — surprising that it’s from the 1600’s. But it’s amazing that even that long ago they were able to build monasteries in such remote places. I’d love to explore both for the history/culture and for the scenery! 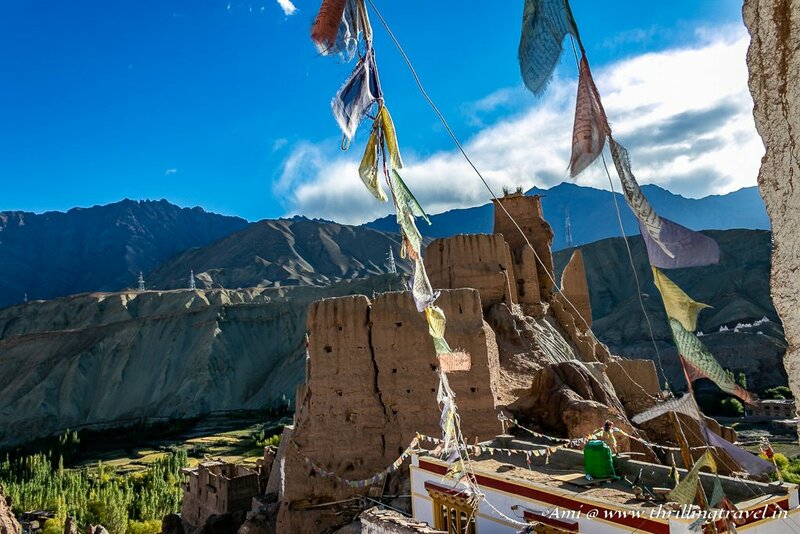 Indeed, Ladakh is perfect for those who love heritage and landscapes. It has so much for everyone. I hope you can make it here and see these ruins for yourself. I can imagine your pulse racing when you got the first view of Basgo Monastery on the hill. I might wonder how we would actually get up there. I agree that they look older than the Mughal time (since that is the same period as the Taj Mahal). It is sorta fascinating to see the earth reclaiming the walls. Although sad to be losing the site. So glad you did not miss finding the amazing room with the 2 storied buddha. The copper buddha was also an interesting find. Definitely a great site to visit. Wow, that is some absolutely incredible scenery. I mean, that backdrop around the Ruins of Basgo is worth a visit alone. It’s great to read about places and sites that I know little to nothing about, and to discover just how much more I need to explore. Great find. Thanks Drew. I was so glad I found them myself. This one definitely is rare and amazing. The third photo down is so captivating – it took my breath away. I love how Basgo looks like ruins, but is actually living and breathing and still active after all these years. I like the addition of the whitewash, as it makes it stand out against the barren landscape beyond. And those shrines are so colourful and beautiful. 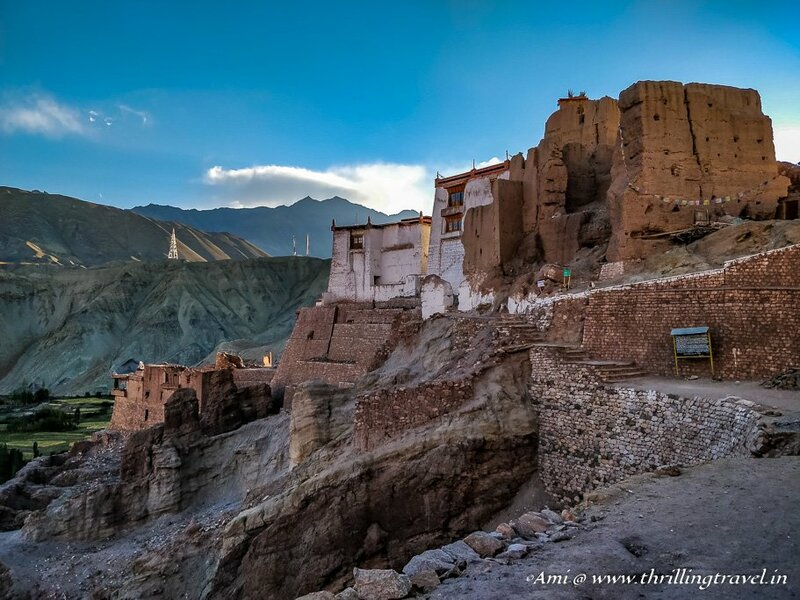 I would love to visit if in Ladakh. I see that you are already captivated with it. I am sure you will love it when you actually see it. Plan a trip to India soon. 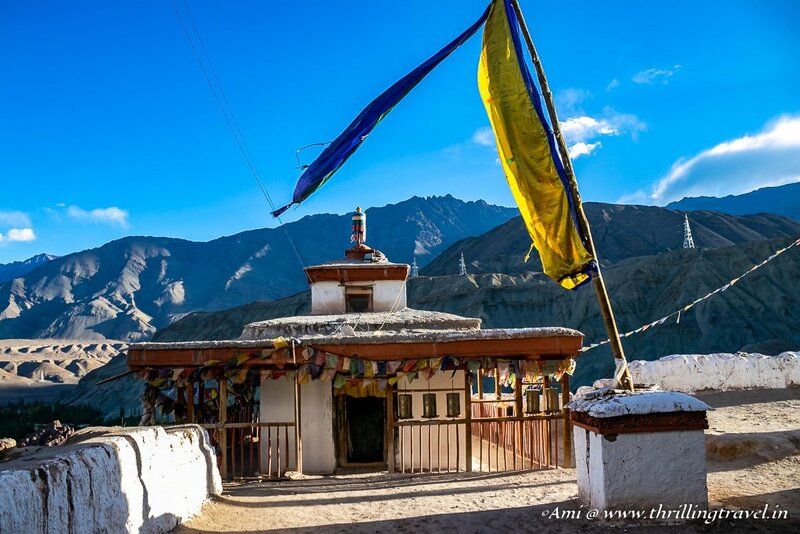 It sure is worth the visit – Basgo and Ladakh in general. These pictures are breathtaking! 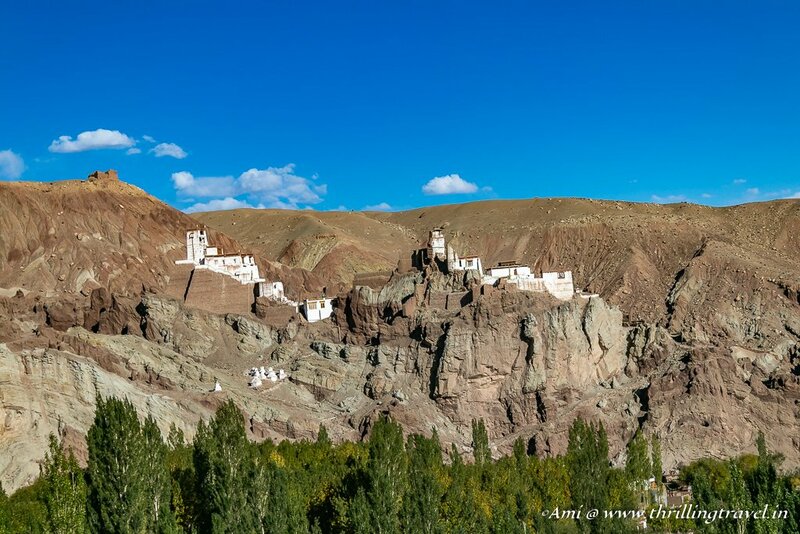 And they make me want to visit Ladakh and Basgo right away. I am also quite interested in Buddhism and the temples in Basgo look so colorful and peaceful at the same time. Which time of the year would be best to visit the region? The history and photos are incredible. I’ve never had the opportunity to visit a monastery but they have always fascinated me. Basgo looks like an interesting spot to explore if I ever make it to India. You’re right, looking at your pictures, I also would’ve imagined this castle and monastery to go further back than the 17th century. Such a pity that it is an endangered world heritage site! I love how the white monastery stands in the brown backdrop and your captures of the crumbling brown earthen walls of the castle against the mountainous backdrops are pretty fantastic! Thank you Medha. It sure is an unusual site. The landscape, the unusual history and its mystic aura….all amazing. Woah what an incredible place! From a distance, you would just think the ruins were part of the rocky mountain face. It blends in! And then to go inside to see the shrines..what a vibrant contrast. I would have thought they were much older too. What a magnificent spot. I do hope they can repair and protect it for the future. Yes, I hope there is some restoration that takes place. This place is too cool to be lost. Thanks for the lovely comment, Juliette. Wow! Basgo ruins and castle looks like it’s out of a fantasty movie. I can picture it in a scene in Lord of the Rings! I’m amazed this gem isn’t more well-known around the world. I hope they continue to preserve this unique and beautiful treasure for future generations to enjoy. I can totally understand why you were so thrilled to visit, Basgo monastery remains look utterly stunning, both the crumbling earth ones and the ones more recently painted in white. The way they seem to almost grow from the rocks is amazing! Thanks Danik. Glad you liked the pics. And fingers crossed for your trip here. Thanks Fiona. It is quite an unusual and special place. You should try and visit it. I really love your energy and willpower to see everything (which is what I sometime lack. LOL). But kidding aside, your exploration of the temple has really peaked my interest with the monastery! How splendid the Buddha are and so colourful! Thank you Marvi. That is so motivating and encouraging. As for this place, trust me, you will find the explorer in you come out. Such jaw-dropping scenery in such a special place. I hope it gets funding for the maintenance of the buildings it would be such a shame if it were left to ruin. Fingers crossed for that. I hope people visit it and they get encouraged to get some funding. That is certainly a thrilling adventure. It sounds like more time would’ve made the visit easier. I’m with you though and would’ve been rushing through, playing truant, to see as much as possible. Beautiful place. Definitely will add to my destinations wish list. Dont know about easier but it sure would have helped me explore a few nooks that I somehow feel I have missed 😉 Thanks for stopping by Elaine. The ruins of Basgo stand so silently and yet a thousand stories seem to emanate from those very ruins. An experience not easily described in words. 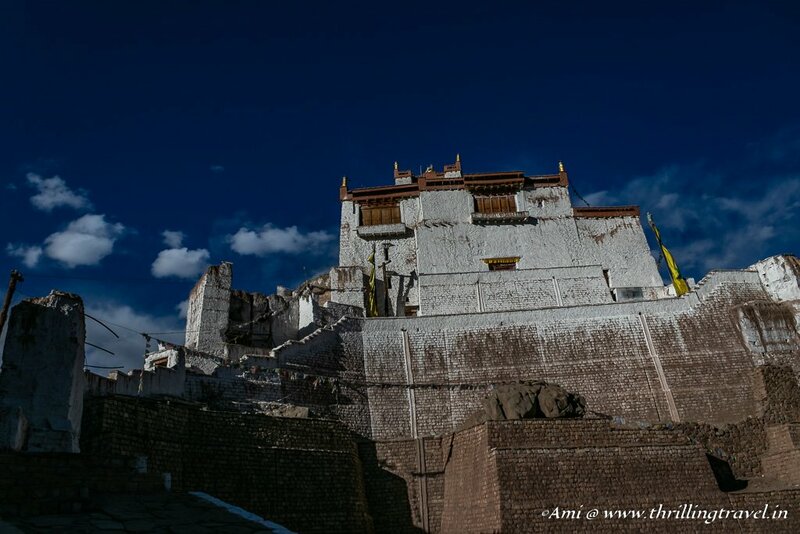 The place is really unique in Ladakh and has a distinct mystical aura that is so riveting. It would have been great if we could have been able to see the sunset from these ruins. It’s surprising how relatively new these ruins are! They are beautiful though and the remains of the castle gainst the greenery is stunning too. Great travel tip reminder about dressing appropriately by the way! It’s easy to overlook that one especiall during summer when it’s hot and you just want to wear short shorts. Thank you Norman. Glad you added it to your list.